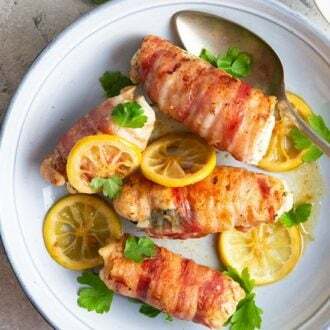 These quick and delicious bacon-wrapped chicken breasts stuffed with spinach and cheese, and served with a lemony white wine sauce are total crowd pleasers! Making for a DELICIOUS protein-packed meal! 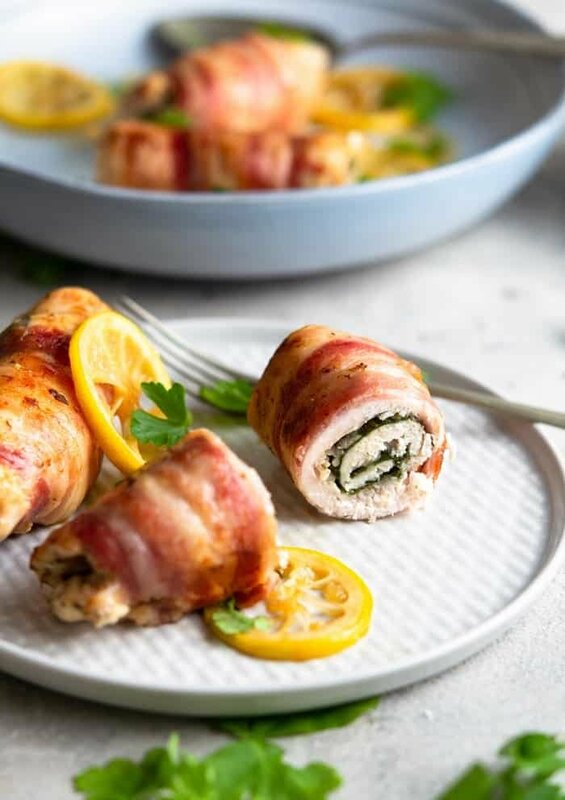 These chicken cutlets are stuffed with cheese and spinach then wrapped in bacon making for a flavor-packed, protein filled meal. These wrapped cutlets look impressive, especially when sliced open, but are very easy to make and come together in a snap! If you can’t find chicken cutlets in your grocery store, simply place a regular boneless, skinless chicken breast between two pieces of plastic wrap, and gently pound with a meat mallet or rolling pin until chicken is ¼-inch thick. Customize this recipe by stuffing the chicken with your favorite cheese, such as smoked gouda or Manchego. Add a sprinkle of crushed red pepper flakes if you’d like a little heat. Double the recipe if your family loves big portions. 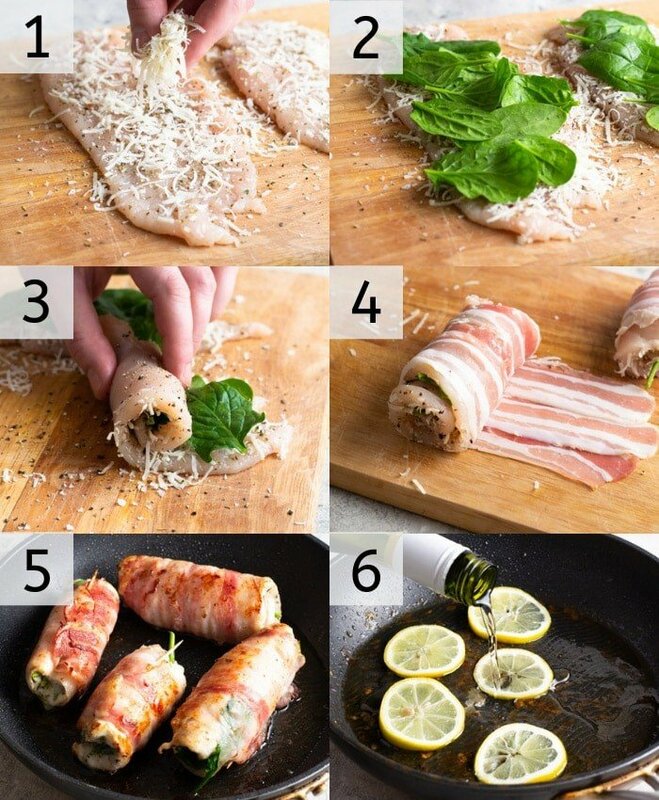 Can You Wrap Raw Bacon around Raw Chicken? Yes! Wrapping the chicken in bacon will keep it very moist and tender while imparting a lot of flavor. Pan frying before baking helps keep the bacon nice and crispy all over. How Long do you Cook Bacon Wrapped Chicken? You need to cook bacon wrapped chicken until the internal temperature reads 165F (75C) on a thermometer. Baking times will vary depending on the size of your cutlets but expect an average of 20 minutes at 350F (177C) if following this recipe. 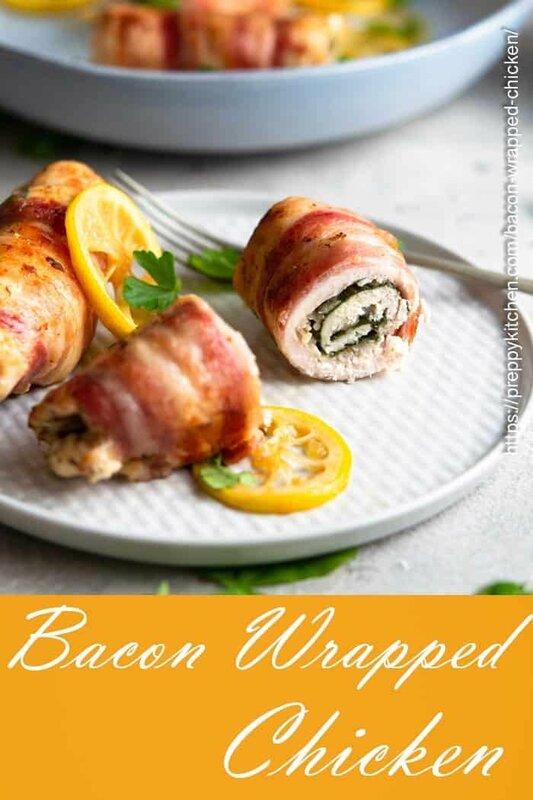 How do You Cook Bacon Wrapped Chicken? Preheat oven to 350F. Place chicken cutlets on a cutting board. Sprinkle cutlets evenly with salt, pepper, Italian seasoning, and Parmesan. Top Cutlets evenly with spinach. Starting with one end, roll chicken to encase cheese and spinach, forming a spiral. In a medium oven-safe skillet, heat olive oil over medium-high heat. Add chicken; cook until bacon is slightly browned on three sides, about 2 minutes per side. Transfer skillet to oven; bake 20 minutes. Remove skillet from oven. Transfer chicken to a plate; cover with foil to keep warm. Add lemon slices and wine to skillet. Cook oven medium heat until lemons are slightly browned, 2 to 3 minutes. Remove from heat. Divide chicken among 4 plates; top with pan sauce. Garnish with parsley, if desired. If you’ve tried this dish then don’t forget to rate the recipe and let me know how you got on in the comments below, I love hearing from you! If you can’t find chicken cutlets in your grocery store, simply place a regular boneless, skinless chicken breast between two pieces of plastic wrap, and gently pound with a meat mallet or rolling pin until chicken is ¼-inch thick. Customize this recipe by stuffing the chicken with your favorite cheese, such as smoked gouda or Manchego. Add a sprinkle of crushed red pepper flakes if you’d like a little heat. Double the recipe if your family loves big portions. Thank you for this recipe, the flavors were so good! I followed this recipe to the T and it was perfect! thanks john! I’m so glad it passed the picky husband test!!! I made this tonight for our Valentine dinner. Surprisingly, it was a very simple recipe to make but does not look or taste simple. Extremely pleased how it turned out! Sauteed sweet potatoes and green beans as the sides. Wonderful! So happy you liked the recipe!! That recipe sounds delicious. Making it this weekend. My mom makes this all the time and I love it.